Tottenham crashed out of the Champions League to Serie A champions Juventus. Paulo Dybala scored the winner on the 67th minute to break Tottenham hearts. Heung-Min Son has given Tottenham the lead on the 39th minute. Tottenham crashed out of the Champions League after a late comeback from Juventus. Spurs had their hearts broken at Wembley despite looking comfortable at half-time. Heung-Min Son had given Spurs the lead on 39th minute to give them a 3-2 lead on aggregate. However, the second-half saw Juventus come out with a hunger that was not seen in the first half. Gonzalo Higuain equalised for the Serie A champions on the 64th minute before Paulo Dybala scored a winner on 67th minute. Harry Kane saw a last minute header hit the post as Spurs were unable to answer the deficit presented to them. Gonzalo Higuain not only scored the goal to draw the sides level but he also assisted Dybala’s winner. While the Argentine was isolated at times, he made the very most of the opportunities he was presented with. Tottenham: Lloris 6, Trippier 6, Sanchez 5, Vertonghen 5, Davies 6, Dembele 5, Dier 5, Eriksen 6, Alli 6, Son 7, Kane 7. Subs: Lamela 5, Llorente n/a. 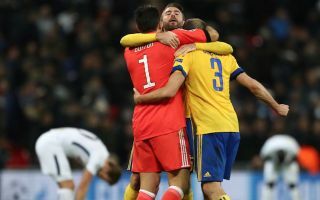 Juventus: Buffon 7, Barzagli 6, Benatia 5, Chiellini 8, Sandro 6, Pjanic 6, Costa 8, Matuidi 6, Khedira 6, Dybala 7, Higuain 9. Subs: Asamoah 6, Lichsteiner 6, Sturaro n/a. Tottenham are replacing Arsenal in all respects – they’ve just gone out in the last 16 in the Champions League. Can they really push on now and finish 4th in the EPL? Juventus have taught Tottenham a hard football lesson!